uns hat es bei Ihnen in der Wohnung 1 sehr gut gefallen. Wir hatten eine super Woche mit super Wetter. Von Jannis ganz liebe Grüße an Niklas und Nina. We are just back to Dubai, the fact is one of the best places we had visit during our holidays in Germany was schwangau ; this means and related to the very happy ten days living in your house. It was more than we can describe as a very friendly family and perfect services and support. We lived and felt in your house as our!! Even my children felt that you is our best neighbors. 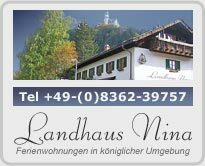 Sure that we will come back to Schwangau not only to visit the castles but also to enjoy living in Landhaus Nina. das mit der Auszeichnung ist ja prima. Jeden Stern, den Ihr bekommen habt, ist gerechtfertigt. Auch wenn wir die letzten 2 Jahre nicht mehr bei euch waren, werden wir alles unternehmen, Eure Gastfreundschaft erneut zu geniesen.